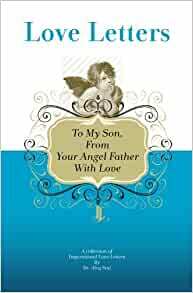 This book is dedicated to all the sons who's fathers have unfortunately died as soldiers, but continue to live in another dimension as angels or loving souls. Most of all this book is to tell you, the son that your father loves you and will love you for ever. Your father wants you to be most of all happy, joyful and live life fully! "Love Letters" collection is one of the best gifts you can offer the people you love and appreciate. Please note that all books in the "Love Letters" series contain the same or very similar messages. Once you buy or receive one for yourself, you'll want to share. Share them as a present for your friend who recently lost her mother, a family member's birthday, a parent or child who needs encouragement, or to make anyone else you can think of, happy. Please share the love and help us all to make this World, the kingdom of love and happiness.